The narcissistic behaviours in the person that you have a relationship with, whether it be a parent, a partner or just a friend, can be extremely damaging and destructive. A narcissists etiquette lacks ethics that include remorse, morals, sympathy, compassion or any emotional impression at all for that matter, all because of their selfish and fragile Ego. People with narcissistic thinking and behaviour strive only to defend their feeble self esteem and will stop at nothing in their world of fantasy to get their needs met. Their expectations are unrealistic and they will often become involved in material things, vanity and may develop excessive life interests that are not real such as movies, hollywood stars and video games. They often place unrealistic demands on others to make themselves feel better. They can not tolerate negative emotional distress and will most often turn it on others and blame them instead of looking within to see their own part of the problem. Excessive selfish people usually insist on having things their own way at the expense of others. When a person with narcissistic tendencies doesn’t get what he or she wanted, he feels devalued and can not tolerate the feelings of fear, hurt, anxiety or despair, they will defend against these feelings all odds. Narcissistic people are never wrong, nor will they ever apologize or admit when they are wrong. They blame others for their mistakes and wrong doings, all the while making someone else responsible for decisions that go array, it will always be someone else’s fault. Narcissists are bullies, they get a sense of feeling superior when they get their way or make others feel bad. People with strong narcissistic traits are not interested in ‘self help’ of any kind, what they do works for them, they get what they want and will never see the damage that they inflict on others. They are unable to see the depth of their disfunction, they never will, as this awareness would trigger a state of great depression in them. 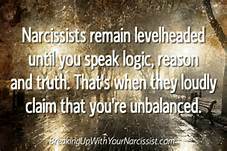 It is important to understand the motives of a narcissist so you can better arm yourself against their detrimental and harmful patterns of behaviours. Their hurtful, unhealthy and certainly disastrous performance towards you can leave you feeling powerless, frail, passive and weakened, this is exactly what they are trying to achieve, all of what they take from you emotionally and mentally is to feed their selfish and fragile Ego’s. If you have someone in your life that at times makes you feel helpless, inefficient or weak then I suggest you begin to work on the courage to remove them from your life, the health of your mind, body and Spirit depends on it. Sensitive people beware, because it is those of you whom are giving, compassionate, caring and kind, theat are the prime targets for a narcissistic person to feed on. Love yourself enough to make healthy choices about who you allow into your beautiful life and the Soul of who you are.